To install Updraft Plus, we simply need to login to our WordPress administration interface (typically yourdomain.tld/wp-admin) and navigate to the Add New plugin page. In the search bar, type in Updraft, find “UpdraftPlus Backup and Restoration”, and click on the “Install Now” button. Once the plugin has finished installing, we will want to active it by clicking on the “Activate Plugin” link at the bottom of the installation status log. The folks at Updraft have made configuring backups extremely easy. 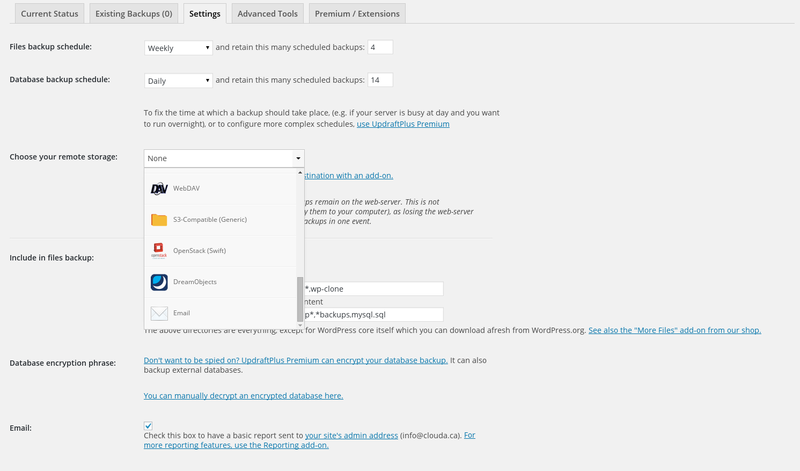 To get started, we’ll navigate to the UpdraftPlus Backups settings in our WordPress administration site. Initially, Updraft is not configured to perform any scheduled WordPress backups by default. In order to start backing up our site automatically, we’ll want to navigate to the “Settings” panel and create a schedule. In our example, we’re going to backup our database daily with 14 days retention, and our files weekly with 4 weeks of retention. 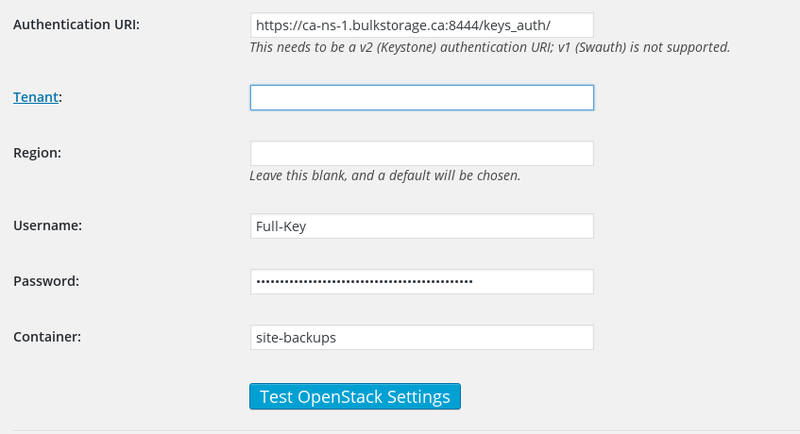 Most importantly, make sure to select “OpenStack (Swift)” as your remote storage backend. Now that we have Updraft’s schedule setup, we’ll need to connect it to a Cloud-A Bulk Storage container. In this example, we’ll be using Bulk Storage’s per-container keys to authenticate. This will allow Updraft to have full read-write access to our website backup files, but absolutely no access to the rest of our Bulk Storage containers. For more information on container keys, check out the documentation at http://docs.clouda.ca/bulk-storage/container-keys. To get started, let’s go to the Cloud-A dashboard and create a container to store our WordPress backups. If you don’t already have a Cloud-A account, you can signup for one in minutes. Once logged in, we’ll navigate to the Storage > Containers page and click on the “New Container” button. 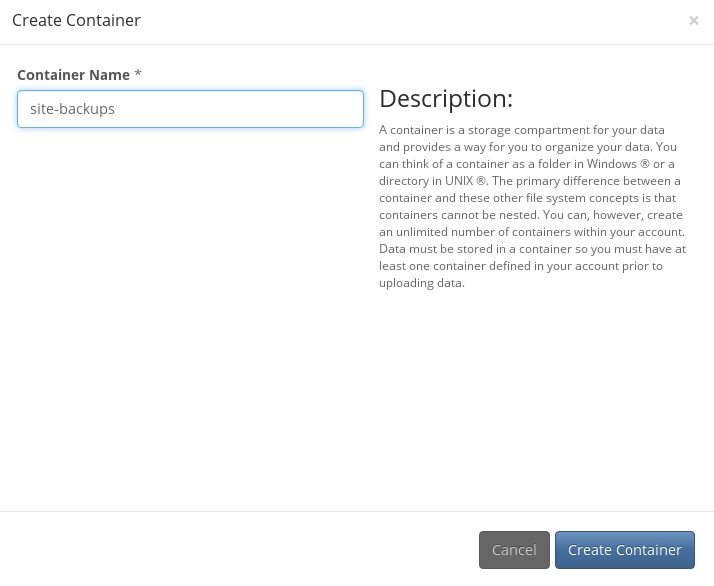 Give your container a name (“site-backups” in our example) and click on “Create Container”. 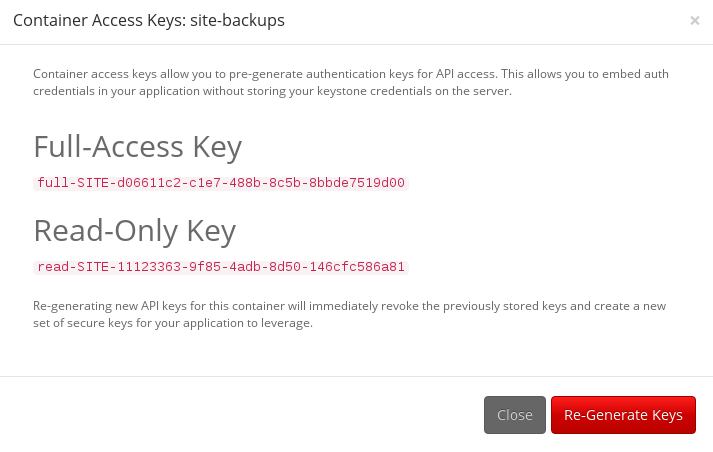 Next, click on the “Keys” button next to your newly created container to generate some API keys. Once complete, we’ll want to go back to our UpdraftPlus WordPress Backups configuration screen to enter our authentication credentials. Make sure to fill in your Tenant ID in the “Tenant” field. You can find your Tenant ID on the API Access screen in your Cloud-A Dashboard. The username in our case will always be “Full-Key” since we are using container-specific API keys, the password is the Full-Access Key that we generated, and Container is the name of our Bulk Storage container that we created. Now that we have our backups scheduled and configured to use Bulk Storage as a remote storage backend, we can manually run an initial backup to test that everything is working properly. Simply click on the “Backup Now” button to start your backup. We will leave all of the boxes checked to perform a full backup. UpdraftPlus will display a progress bar during the backup process. Once the backup has completed, we can navigate to our container in the Cloud-A dashboard and we should see all of the backup files that Updraft has created. 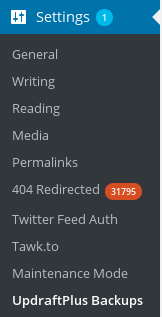 Now the next time that you have a hardware failure, or that new marketing intern decides to delete half of your homepage, you can easily restore your lost data directly from your WordPress control panel. In the case of a complete failure, recovery is as simple as standing up a new installation of WordPress, installing and configuring UpdraftPlus as per this tutorial, and using the restore function. 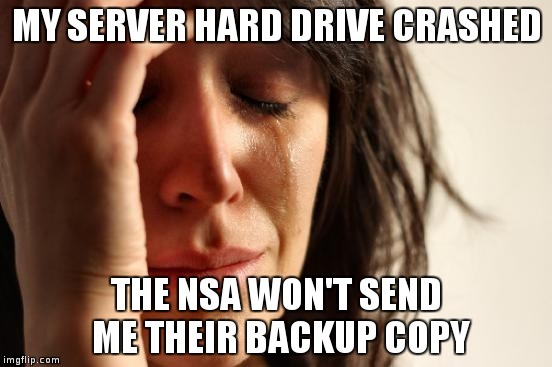 Stop using the NSA as your backup strategy and start taking control of your data today! Take Control with Simple WordPress Backups!